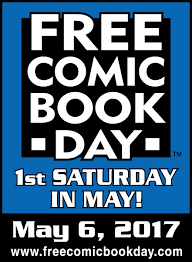 I'm 99% sure if you read my blog you already know this, but this Saturday is Free Comic Book Day! That's right, May 6th, 2017 is when you can go to any comic shop taking part in the event (which almost all are) and get special comics created just for this day. A variety of stores commemorate this awesome occasion through a number of methods such as sales, having comic-creators present, or even free food and live bands. I for one am extremely excited for Free Comic Book Day (as always) and am eager to enjoy it!